A number of accommodation managers in Victoria have been receiving unsolicited emails requesting that they renew their listing on the Victoria Tourism website at www.victoriatourism.com.au. Before going any further, it is very important to note that Victoria Tourism is in no way related to the official government tourism organisation of Tourism Victoria. In fact, the company behind the confusingly named Victoria Tourism website is Accommodation Find Pty Ltd – one of several companies based in Queensland who have a history of false billing scams. 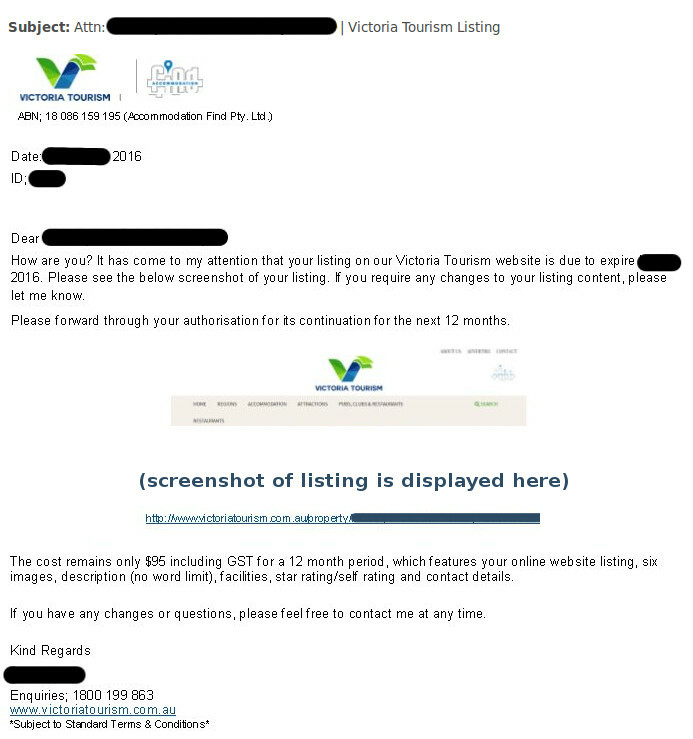 Instead of past practices of sending out what resembled bills in the mail for advertising on their websites, their tactic for the Victoria Tourism website is to send out emails requesting authorisation for continuing an apparently existing listing. A copy of a typical email sent out by Victoria Tourism (Accommodation Find Pty Ltd) is shown below, with the personal details of the recipient removed. The email is rather strange, being a screenshot of a letter which isn’t very clear and is not easy to read. 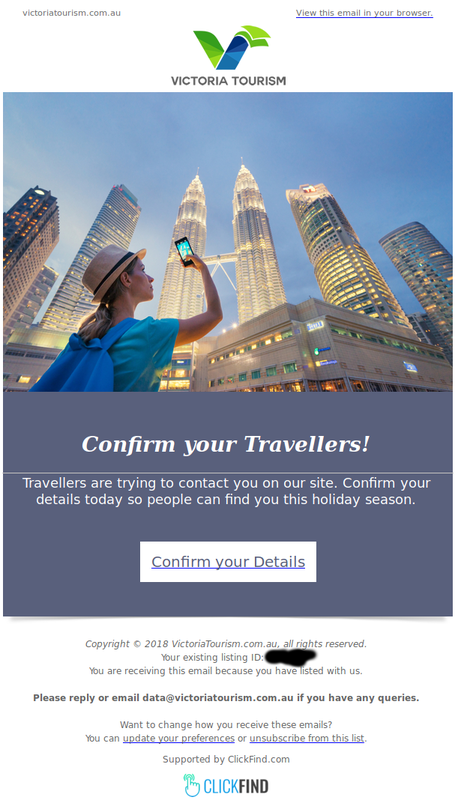 Many accommodation providers who receive this email never signed up for a listing on the Victoria Tourism website and may be unaware that they even had a listing on there. This implies that the recipient of the email has already authorised and paid for at least one 12 month advertising period and is being asked to pay $95 to renew it for another 12 months. However, these implications are false. The Victoria Tourism website has only been running in its current form since the end of 2015. How can all these accommodation providers who are receiving this renewal email be at the end of their 12 month advertising period in March 2016? The organisation behind the Victoria Tourism website also previously created the Vic Tourism website at www.victourism.com.au. Read about the history of the Vic Tourism website for further information. The website title of Victoria Tourism is an exact reversal of the two words which constitute Victoria’s official government tourism body of Tourism Victoria. Such word tactics are a common method used to try and confuse people into thinking they are dealing with an official organisation or popular brand. If you have inadvertently provided authorisation to Victoria Tourism to bill you for an accommodation listing that you thought was with Tourism Victoria, you can lodge a report with the ACCC by visiting their report a scam page. Specify “false billing” as the scam type in your report. A number of accommodation providers have received unsolicited emails from the Victoria Tourism website requesting that they check their listing and review the details. An example of such an email is below. It is unclear if there is a cost involved in updating such a listing when invited to do so via email, however when examining the advertising page, an annual cost of $99 is mentioned. For those who may at first glance assume that Victoria Tourism is in fact Victoria’s official tourism body, then the Queensland postal address they provide should make it clear that is not the case. The organisation behind the Victoria Tourism website has recently began sending out more emails, requesting businesses check their details on a new website titled HotelFind – www.hotelfind.com.au. Again, it is unclear if there is a cost involved in claiming or updating a listing. This is quite a bold statement given that the website has only been online for a few months, and that the website owner, Amanda Stichbury, was fined and convicted by a court of law in 2014 and also in 2017 for breaching Australian Consumer Law over a series of false billing charges. 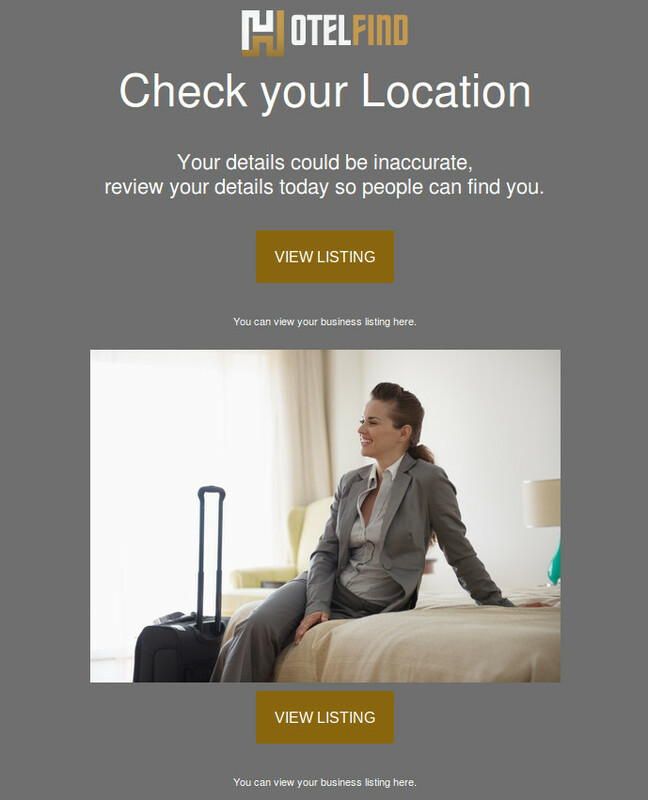 Anyone who receives an invitation from HotelFind to check their business details should confirm if there are any costs associated in updating or maintaining their listing. If costs are involved, the benefit of having a listing on the HotelFind website should be carefully considered. We have received reports that some accommodation providers and tourism businesses in Victoria have received unsolicited emails from Victoria Tourism in regards to listings they apparently have on the www.victoriatourism.com.au website. “You are receiving this email because you have listed with us” is the justification for receiving this in the email, although the businesses that have contacted us say they never signed up for a listing. 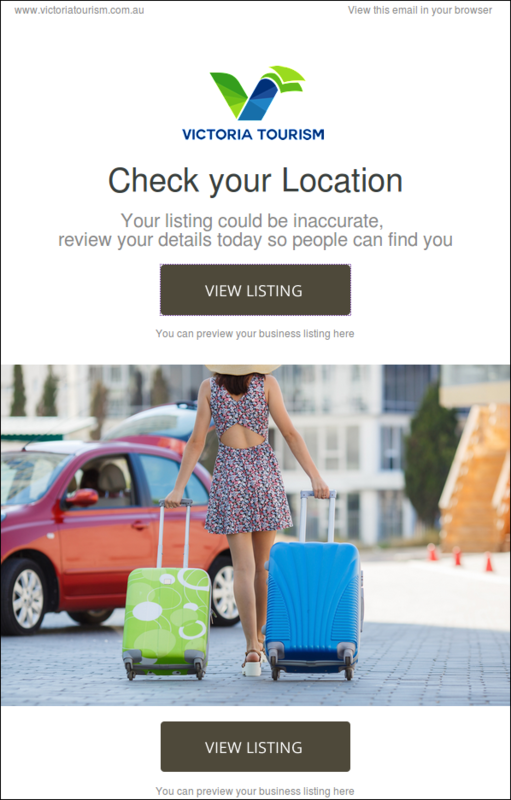 The Victoria Tourism website claims to have tens of thousands of businesses that have listed with them, yet the vast majority of listings have a “claim business” button displayed, implying that these businesses have not actually applied for a listing. A example copy of an unsolicited email is included below. Note there are no contact details displayed in the email, other than the email address of data@victoriatourism.com.au and links to click on in order to confirm the business details. The email states that Victoria Tourism is “supported by ClickFind.com”. An example of an unsolicited email from the Queensland based organisation of “Victoria Tourism”. Anyone who receives this email from Victoria Tourism to check their business details and receive the enquiries that are claimed to have occurred should confirm if there are any costs associated in updating or maintaining their listing. If costs are involved, the benefit of having a listing on the Victoria Tourism website should be carefully considered. Visit Victoria (Victoria’ official government tourism organisation) and the Australian Tourism Data Warehouse (ATDW) have been recently inundated with reports of its members being hit with requests by Queensland based “Victoria Tourism” to claim their business listing on their website (www.victoriatourism.com.au), then hitting them with a bill for it. Visit Victoria has described the organisation behind this as a “scam company”, given its long history of false billing scams which resulted in the company being convicted and fined in a court of law during both 2014 and 2017. Visit Victoria and ATDW have stated that they are “providing evidence of these invoices to the Office of Fair Trading in Queensland, who are building a case to take enforcement action against the scam organisation“. Accommodation businesses operating within the Great Ocean Road region in Victoria have been on the receiving end of a false billing scam. It has been operating since 2012, resulting in bills being sent out for unauthorised advertising on a tourism website. 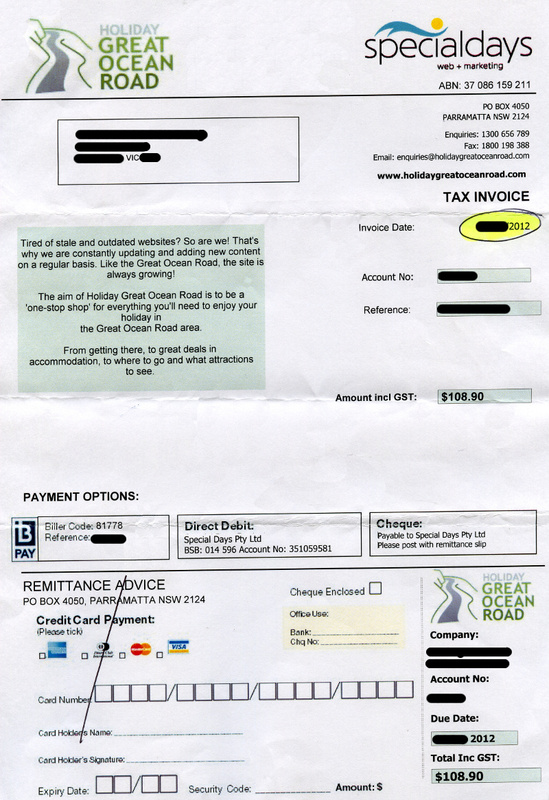 Invoices are being sent out by Holiday Great Ocean Road for advertising on the www.holidaygreatoceanroad.com website. A sample of a typical invoice they post out in the mail is shown below. Most people who receive an invoice like this never actually signed up for a listing with Holiday Great Ocean Road. The first they find out about it is when a bill arrives in the mail. If they ignore the bill, they may receive more of the same invoices in the future. “I emailed you several times and phoned your business but I was unable to get a response.” This statement is generally false as most accommodation providers have never been contacted by phone or email prior to the invoice arriving in the post. “Once the listing is deleted you can lose your ranking on holidaygreatoceanroad.com for key words as well as your Google ranking as the site is optimized for your establishment.” This is a very misleading claim. Firstly, the www.holidaygreatoceanroad.com website receives so few visitors (not even Alexa.com has any data for it at the moment) so it is unlikely that a listing, or lack of one, will make any difference to a business. Secondly, because www.holidaygreatoceanroad.com is so poorly ranked in Google, there is only minuscule Google ranking value provided in the form of a link to an accommodation provider’s own website. Accommodation listings on the Holiday Great Ocean Road website are typically created by copying information, including wording and photos, found on other websites that an accommodation provider is listed on. This process may be automated which means vast numbers of listings can be created with very little time and effort. If this data collection process occurred a long time ago, it may mean information they are displaying can be quite out of date. This may negatively impact upon your business or mislead people who do happen to view your listing on the Holiday Great Ocean Road website. Unfortunately, some accommodation providers have paid the invoice for advertising they never ordered due to confusion over business names. The Holiday Great Ocean Road / www.holidaygreatoceanroad.com name and website address may be confused with a well-established business with exactly the same name but different website address – Holiday Great Ocean Road / www.holidaygor.com.au. It must be stated that the latter (www.holidaygor.com.au) is an award-winning and reputable accommodation booking service which has operated with the utmost of integrity since its commencement in 2002. It is extremely important that accommodation providers keep current list of all organisations they are advertising their accommodation with to ensure that any false bills, particularly those with similar names to reputable businesses, are quickly identified. Should there is any doubt about the authenticity of a bill, contact the sender and ask for proof of authorisation. For more information refer to the false billing scams information page on the ScamWatch website which has been set-up by the Australian Competition & Consumer Commission (ACCC). If you’ve unintentionally paid money to Holiday Great Ocean Road, or even if you just receive one of their unauthorised bills in the mail, you can lodge a report with the ACCC by visiting their report a scam page. Specify “false billing” as the scam type in your report. A new false billing scam is actively targeting those who manage accommodation properties in Victoria. Bills are being posted out for unauthorised advertising on a website which bears a name very similar to Tourism Victoria – Victoria’s official tourism body. Unauthorised bills are being sent out by VIC Tourism for advertising on the www.victourism.com.au website. Below is a sample of an invoice they post out in the mail to many accommodation businesses. To ensure that in the eyes of the law this tax invoice is regarded an optional invitation to advertise, there is wording on the invoice which states “this invoice is only payable if you wish to subscribe or renew your existing subscription for the product”. Most people who receive an invoice like this never actually signed up for a listing with VIC Tourism. The first they find out about it is when a bill arrives in the mail. If they ignore the bill, they may receive subsequent invoices at regular intervals in the future. Accommodation listings on the VIC Tourism website are typically created by copying information, including wording and photos, found on other websites that an accommodation provider is listed on. This process may be automated which means vast numbers of listings can be created with very little time and effort. If this data collection process occurred a long time ago, it may mean information they are displaying can be quite out of date. This may negatively impact upon your business or mislead people who do happen to view your listing on the VIC Tourism website. Leigh Harry, CEO of Tourism Victoria, urges all Victorian businesses not to fall for the ‘VIC Tourism’ false billing scam. The way the advertising bills have been sent out has convinced some accommodation providers into thinking that VIC Tourism is the Victorian government’s official tourism organisation Tourism Victoria. This has resulted in some people paying the bill because they believe they are registering their accommodation for world-wide exposure and endorsement through the state’s official tourism body. 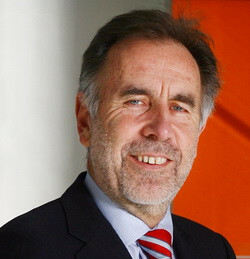 The chief executive officer of Tourism Victoria, Leigh Harry, has issued a strong warning through several media outlets to all businesses in Victoria to be on the look out for what he describes as “a dodgy letter and invoice” which seeks payment for an unsolicited 12-month listing on the unofficial and low-traffic Vic Tourism website. Mr Harry has warned that the letters and invoices being sent out by Vic Tourism are “a scam”, and they are not related in any way whatsoever to Victoria’s official tourism organisation. It is critically important that all accommodation providers keep an accurate list of all organisations they advertise their accommodation with. This ensures that any false bills, particularly those with names very similar to official organisations, are quickly identified. If there is any doubt about the authenticity of a bill, contact the issuer immediately and ask for proof of authorisation. For further information, refer to the false billing scams information page on the ScamWatch website which has been set-up by the Australian Competition & Consumer Commission (ACCC). If you have inadvertently paid money to VIC Tourism, or even if you just receive one of their unauthorised bills in the mail, you can lodge a report with the ACCC by visiting their report a scam page. Specify “false billing” as the scam type in your report. A false billing scam which began in 2010 is still targeting accommodation providers in Victoria. It involves sending out bills for unauthorised advertising on a travel website. 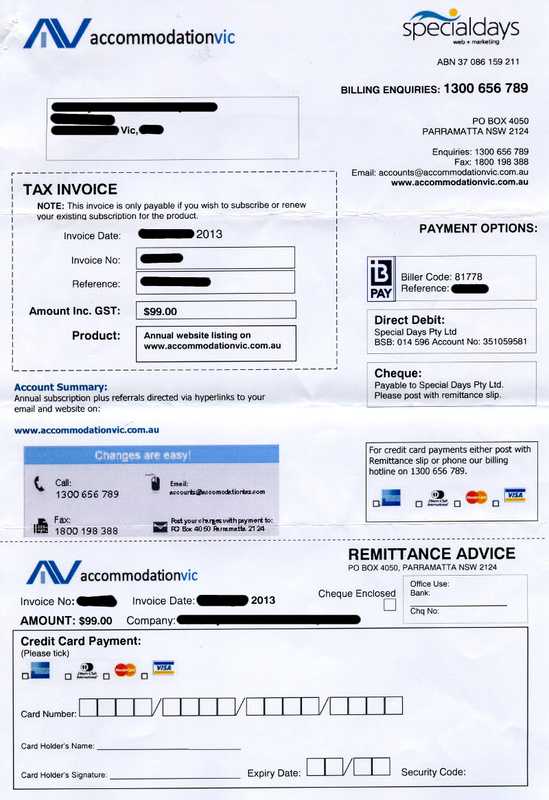 The unauthorised bills are sent out by Accommodation VIC for advertising on the www.accommodationvic.com.au website. Refer below to a sample of the invoices they post out in the mail to accommodation businesses. 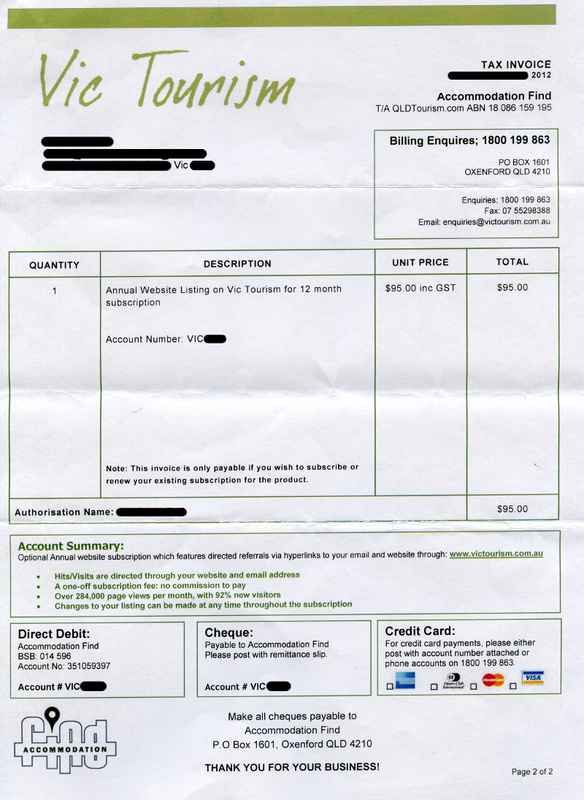 In order to legally disguise this tax invoice as an optional invitation to advertise, there is wording on the invoice which states “this invoice is only payable if you wish to subscribe or renew your existing subscription for the product”. Most people who receive an invoice of this type have never signed up for a listing with Accommodation VIC. The first they find out about it is when a bill arrives in the mail. If they ignore the bill, they will typically receive another one sometime in the future, despite the fact wording on the letter attached to the bill states that the listing “automatically expires if unpaid”. It has been reported that at least one business who actually did end up paying the $99 annual listing fee then received another bill in the mail only 6 months later for another $99. As there are no starting and ending dates for the listing period specified on the invoice, just vague wording of an “annual website listing”, it is unclear exactly what period the listing fee covers. Accommodation listings on the Accommodation VIC website are typically created by copying information, including wording and photos, found on other websites that an accommodation provider is listed on. This process may be automated which means vast numbers of listings can be created with very little time and effort. If this data collection process occurred a long time ago, it may mean information they are displaying can be quite out of date. This may negatively impact upon your business or mislead people who do happen to come across your listing on the Accommodation VIC website. They have recently taken over the business. When the bill arrives, they assume the advertising must have been ordered in the past by the previous owners and therefore the listing is effective and good value. The website name is similar to one that they currently list with. In the confusion, they simply pay it, wrongly assuming it’s their authorised advertiser. They are too busy to spend much time investigating it. Given that the bill is for a relatively small sum, they decide it is more cost-effective just to pay it and get it out of the way rather than conduct an extensive assessment of it. Competition with other accommodation listed. If other accommodation in their local area is displayed on the www.accommodationvic.com.au website, they may feel pressured to keep the listing. However it is important to realise that not only are many of listings on Accommodation VIC unauthorised, but that website receives only a small number of visitors compared to other similar websites. It is important that accommodation providers keep an up to date list of all organisations they have advertised their accommodation with to ensure that any unauthorised bills are quickly detected. If there is any doubt about the authenticity of a bill, simply contact the issuer and ask for proof of authorisation. If you’ve unintentionally paid money to Accommodation VIC, or even if you just receive one of their unauthorised bills in the mail, you can lodge a report with the ACCC by visiting their report a scam page. Specify “false billing” as the scam type in your report.